Our Desktop makes the perfect addition to your loft. It can be placed on either side of the loft and either underneath or at the end of the loft. It can also be used at the end of the High Rise Bed. 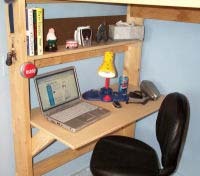 It is great for a laptop computer or a LCD monitor and keyboard. Weight capacity is 40 lbs. 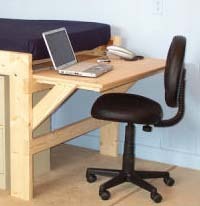 The desktop goes the full width of the loft (Twin 41" - Full 56" - Queen 62") and is 20" deep and 30" from the floor. It is attached to the second rung with two angled side supports (the first rung makes a nice foot rest).